SELF-WATERING, 2-WEEKS+ DEEP RESERVOIR: No more troublesome wicks that clog and stop working. Patented design integrates self-watering features into the body of the planter. Hollow legs reach down to the reservoir and help the soil draw moisture naturally while lifting your plant above the water, keeping its delicate root system from being constantly flooded, minimizing upkeep while eliminating common problems associated with other planters and with over-watering. SELF-AERATING, PREVENT MOLD & FUNGUS: Stop poking holes in your soil. Integrated into the body of the planter are additional large open slats on the bottom that are designed to maintain air circulation through the soil, preventing mold and fungus commonly found with other self-watering planters. Keep your plants healthy, and your home healthy as well. EASY TO FILL, NO OVERFLOW: Each planter comes with an easy to use clip-on attachment for easy watering. Fill up the deep reservoir directly instead of pouring through the planter & risking an overflow. Leave it on, or use when needed to maintain a sleek modern look. MINDS YOUR FLOOR: The reservoir dish is designed with studs on the bottom to lift the entire planter away from your floor and to prevent circular water stains typical of other flat-bottomed planters. 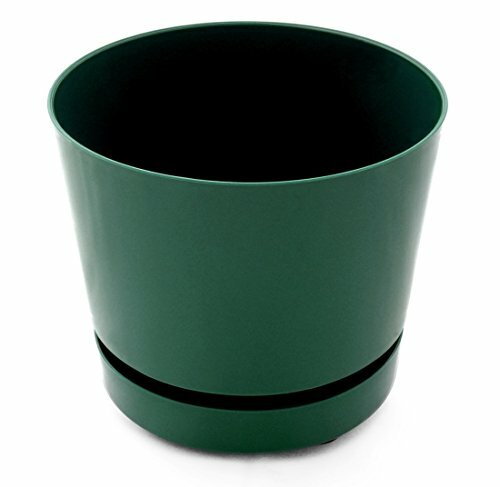 SAFE 100% UV STABILIZED PLASTIC & PIGMENTS: Intended for indoor AND outdoor use, the planters are made from UV stabilized polypropylene (PP) plastic and will not become brittle under the sun. Polypropylene planters are safe and do not leach harmful chemicals into the soil or water, and is 100% BPA-free. The pigments used in this planter are UV resistant to maintain the beauty of the planter for many years. Not painted. Colors will not fade, will not peel, will not become streaked or patchy when left under the sun. SELF-WATERING, 2-WEEKS+ DEEP RESERVOIR: No more troublesome wicks that clog and stop working. Our patented design incorporates an integrated self-watering feature into the body of the planter. Hollow legs reach down into the reservoir to allow the soil itself to draw moisture naturally while lifting your plant above the water, keeping its delicate root system from being constantly flooded, minimizing upkeep while eliminating common problems associated with other planters and with over-watering. SELF-AERATING, PREVENT ROT & MOLD & FUNGUS: Open slats integrated into the body of the planter are designed to maintain oxygen circulation through the soil and around the bare root, minimizing the risk of rotting, mold, and smelly fungal growth that plague other self-watering planters. Keep your plants healthy, and keep your home healthy as well. EASY TO REFILL, NO MORE OVERFLOW: Each planter comes with an easy to use clip-on watering attachment to make it easy for you to water your plants. Fill up the deep reservoir directly instead of pouring water through the planter and risking an overflow. Leave it on for ease of use, or clip it on when necessary to maintain a sleek modern look. MINDS YOUR FLOOR AND CARPET: The integrated deep reservoir dish is designed with studs on the bottom to lift the entire planter away from your floor and to prevent circular water stains typical of other flat-bottomed planters. SMOOTH GLOSS FINISH: Safe 100% UV stabilized plastic & UV resistant pigment. Intended for indoor AND outdoor use, the planters are 100% BPA-free, made from UV stabilized polypropylene (PP) plastic while the pigments are UV resistant and part of the plastic material, not painted on. Polypropylene planters are safe and do not leach chemicals into the soil or water, will not become brittle under the sun, will not fade, or become patchy, or peel. If you have any questions about this product by HBServices USA, contact us by completing and submitting the form below. If you are looking for a specif part number, please include it with your message.